What is the cane toad, Chaunus marinus? The cane toad (otherwise commonly known as the marine toad, or giant toad) is continually being reclassified by the scientific community. Historically known as Bufo marinus, it was reclassified as Rhinella marina and finally as Chaunus marinus. Regardless of the name by which it is recognized, there is no dispute that this species is among the largest of toads on the earth. The cane toad is native to regions of the Americas, but as a result of the human transportation of toads, the toad also exists in many other places in the world. While the toad poses no problem to creatures within its "original" habitat, it is very problematic to areas in which it is exotic --namely, where humans introduced it. Within such ecosystems, such as Australia, the toad interferes with the “dog eat dog” relationships of the food chain. In this way it alters the natural balance among species. Why is a domineering species a problem? To alter the dynamics of the food web alters the population size of native organisms and sometimes even results in species going extinct. 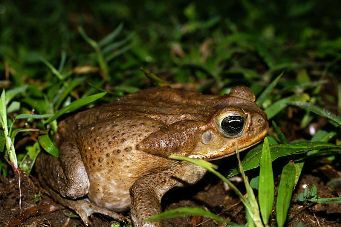 It is a huge problem that is blamed on a huge toad (this toad can weigh pounds and be the size of your dinner plate!). All that aside, the introduction of cane toads to areas in which they are not native isn't the fault of the toads; we humans can accept the blame for that. 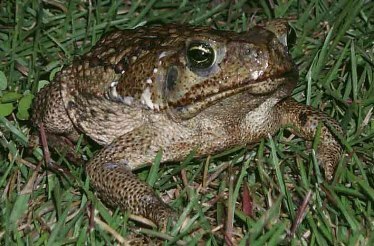 What is the fault of the cane toad? That you can learn here. Mostly, the toad is at fault for eating anything that will fit in its mouth, having a huge appetite, having an explosive reproductive ability (upwards of 30,000 eggs from 1 large female), being very poisonous and thus lacking predators outside of its native locations, and being incredibly adaptive to life anywhere. When it resides in a location to which it is not native, the cane toad is simply too competitive to play nicely! While you can start learning anywhere, I suggest that you begin your tour of "all things cane toad" with a bit of information on their habitats and where the toads reside. Learn about habitat.